Global Uncoated Paint Protection Film (UPPF) market was valued at more than USD 900.0 million in the year 2016 and it is expected to reach more than USD 1,400.0 million by 2024. The report covers forecast and analysis for the Uncoated Paint Protection Film (UPPF) Market on a global and regional level as well as country level. The report also provides historical data of past three years of the market for better understanding the dynamics and trends prevalent in the market. Detailed information about the market opportunities is discussed. The total volume of UPPF (million square feet) sold in the market has been determined on a global and regional level as well as country level. The Uncoated Paint Protection Film (UPPF) Market has been analyzed using Porter’s Five Forces Analysis. The market is segmented on the basis of product type and application, which in turn bifurcated on regional and country levels as well. The report deals with the in-depth quantitative and qualitative analyses of the Uncoated Paint Protection Film (UPPF) Market. Detailed list of suppliers of UPPF provided in the report. The report provides key trends and key takeaways observed in the market. Global Uncoated Paint Protection Film (UPPF) Market deals with films which are utilized to protect painted surfaces in automotive industry, electrical and electronics industry, and aerospace & defense industry among others. UPPF is a thermoplastic urethane film widely used on bare painted surfaces. These films are generally available as transparent paint protection film, ultimate paint protection film, and premium self-healing film among others. The Global Uncoated Paint Protection Film (UPPF) Market was valued at around USD 900.0 million in the year 2016 and it is expected to reach more than USD 1,400.0 million by 2024. The global Uncoated Paint Protection Film market is expected to exhibit a CAGR of more than 5% between 2017 and 2024.In terms of volume, the demand for UPPF is expected to reach more than 90 million square feet in 2024 at a CAGR of more than 4.5% during the forecast period. The major factor driving the growth of Uncoated Paint Protection Film (UPPF) Market is an expansion of automotive industry across the globe and rising demand for UV-curable paint protection film. 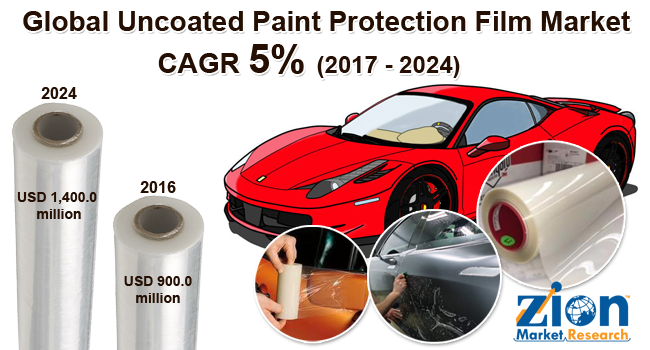 Additionally, increasing demand for UPPF from developing economies coupled with increasing government spending on advanced energy systems would further drive the growth of Uncoated Paint Protection Film (UPPF) Market during the forecast period. Some of the developed regions have regulatory restrictions on materials used for manufacturing UPPFs owing to environmental hazards. Stringent regulatory and environmental laws for the adoption of UPPF and slower adoption rate in emerging applications are expected to arrest the growth of this industry in the years to come. Transparent Paint Protection Film is clear and transparent. It does not change the color or alter the look of the painted surface. It maintains the original shade of the painted surface. Thus, this type of UPPF is in high demand across the globe. However, yellowing and stains appearing on the film due to exposure to sun and other factors could hamper the demand for Transparent Paint Protection Film during the forecast period. UPPF are widely utilized in automotive industry to protect the paint from corrosion, scratches, dents, rust, and other external factors. Increasing number of cars coupled with increasing trend of electric vehicles (EVs) is expected to boost the demand for UPPF in the automotive industry during the forecast period. The automotive industry is dominating the Uncoated Paint Protection Film market. The market is developing at a rapid rate in the developing regions. The major market share for the Uncoated Paint Protection Film market was contributed by the Asia Pacific. There is rising awareness in the Asia Pacific regarding the benefits of UPPF since it protects the uncoated paint for longer duration and offers the cheaper option as compared to repainting. China, Japan, and, India, ASEAN, and South Korea are some of the leading countries in the Asia Pacific to adopt UPPF. The report includes detailed profiles of the prominent market players that are trending in the Global Uncoated Paint Protection Film market. The list of the players that are compiled in the report are3M Company, Argotec, Avery Denison, Eastman, Hexis SA, Orafol, PremiumShield, XPEL and much more. The prominent market players maintain the competitive edge in the global market by spending more on research and development activities to bring innovative solutions for diversified industries. Most of the leading manufacturers are focusing on innovating and developing self-healing and clear (transparent) Uncoated Paint Protection Film. The trend is to produce clear and transparent UPPF with self-healing properties.